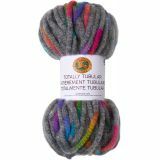 Lion Brand Totally Tubular Yarn - Oyster Shell - Lion Brand-Totally Tubular Yarn. Make waves with this fashionable jumbo yarn. The painterly colors are knitted in a tube that is filled with a lightweight stuffing. Make show-stopping accessories in less time than it takes to watch one episode of your favorite television show. One hank makes a stylish hat or cowl. Content: 89% acrylic 11% polyamide. Putup: 3.5oz/100gr, 87yd/80m. Gauge: 6sx8r = 4in/10cm on size US17/13mm knitting needles. Suggested crochet hook size USQ19/15mm. Dyelotted; we try but are not always able to match dye lots. Care: hand wash and lay flat to dry. Comes in a variety of colors. Each sold separately. Imported.